Fifty-five birders set off at 6 a.m. on the Grande for a 12-hour pelagic adventure to the Nine and Thirty Mile Banks. We cruised around the bait docks for the usual suspects (pelicans, cormorants, gulls, herons and egrets) then set off to sea. We followed much the same route taken on the April 13th trip. The big difference from the April trip was a stout south wind, which caused more boat motion than expected in the outer channel of the bay. Grande is a big solid boat, so we motored on. An indication of how the wind was affecting seabirds, Pink-footed Shearwater is usually seen beyond ten miles but one of the first shearwaters of the day was a Pink-foot not far offshore. Next up was an unusually large flock of Least Terns. Least Terns frequently feed in the area off the tip of Point Loma, all the way out to the Nine Mile Bank. The estimated 100-plus birds seen five miles from “the Point” were a fair percentage of the breeding birds from around San Diego Bay. We saw several other small groups or pairs out to 18 miles. Next up, a pair of Scripps's Murrelets chased into flight ahead of the boat. 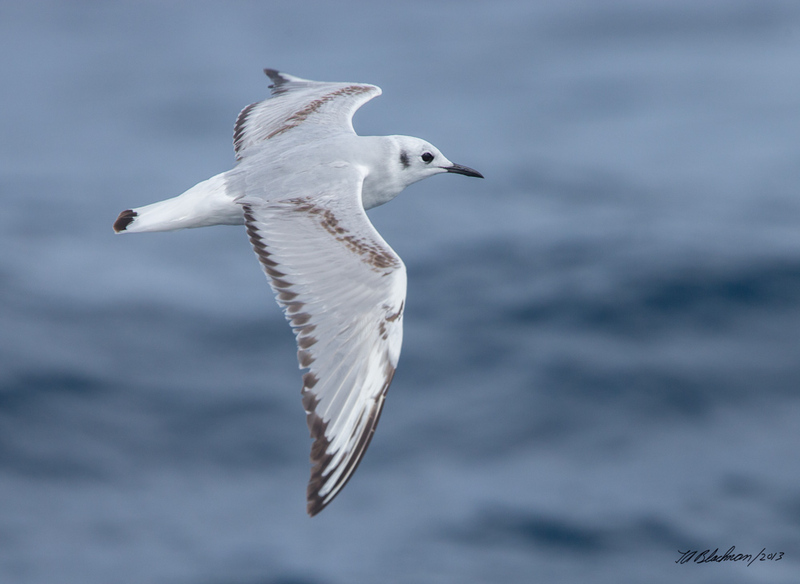 We expected to see more of this species but the sea surface was much too rough for easy sightings, and birds that did not fly were very tough to get on. Six for the day was a very poor number but not surprising considering the conditions. 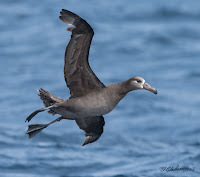 We turned north on the Nine Mile Bank for a little easier ride, but found things a bit sparse: Sooty and Pink-footed Shearwaters in small numbers, a few small high flights of Pacific Loon, a scattering of Red-necked Phalaropes, Cassin's Auklets and even a couple of lagging Surf Scoters. 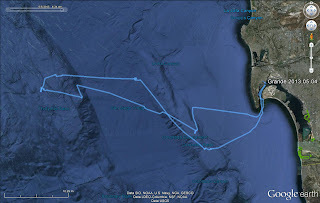 We caught sight of a few offshore Bottle Nosed Dolphin and a few lucky folks caught a brief glimpse of a Minke Whale. Near the north end of The Coronado Escarpment (of which the Nine Mile Bank is part), we started to see a few distant Black Storm-Petrels. One little cluster appeared to be feeding so we turned on them to see if we could get a closer look. Unfortunately, they scattered rather quickly. A late report of a smaller all-dark storm-petrel came from this location. Both Ashy and Leach's (Chapman's) are possible here. The strong winds made the normally distinctive characteristic flight patterns of these species moot. Everything was zipping about erratically. We first had a distant look at an adult Pomarine Jaeger, followed by a much closer look as our chummed gull flock finally pulled it in. Should be some nice photos out there. We made a sharp left turn and headed for the Thirty Mile Bank. Often the San Diego Trough can be a very quiet zone. We found it so today. 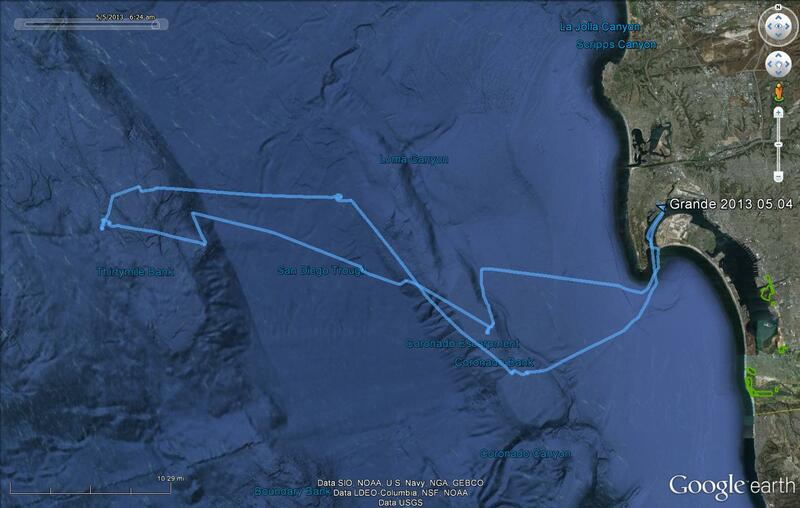 We did get some looks at Short-beaked Common Dolphin here, but many fewer than recent trips. The Thirty Mile Bank is always an enigma. Rarely any big number of birds here (except for the storm-petrel rafts), sometimes nothing at all, then once in a while, that once-in-a-lifetime rarity. Today we had no rarities. Not many birds as expected, but our only Red Phalaropes, Sabine's Gulls, and a Common Tern for the day. All were nice birds for the trip. The Common Tern is misnamed for San Diego as they have been seen only in small numbers in recent years. We spent more time zigging and zagging around the bank hoping to put together enough storm-petrels to warrant a chum slick and drift. No luck there. the Murrelets. We also picked up a late immature Bonaparte's Gull here, before we set off toward the bay. We made a little jog up the inside of the Nine Mile Bank in a last-ditch hope for views of Scripps's Murrelets, without success. We did have a last-minute Black-vented Shearwater that created some discussion about a possible Manx due to the lower light angle with a little sun breaking through. Leveler heads corrected the rest of us to the more likely Black-vent, most now well south at their breeding islands. Our last stops were the Zuniga Jetty, which was buried with the high tide, and Ballast Point. The former had a number of Caspian Terns. The latter was quiet, except for an Osprey on a light-pole nest. Cool air temperature (mid-60's), winds from the south (12-20 knots), heavy overcast to partly cloudy, sea surface temperatures of 63.4-64.5.